This is a new fine art print work by John Olsen titled “ Jacanas, the Christ Bird 1983 “, it is a limited edition quality fine art print signed and titled by John Olsen, the edition has been limited to 99 only, the sheet size is 84.4x107cm. The print “Jacanas, the Christ Bird 1983” is made on high quality Archer’s archival paper using the best quality technology affordable. 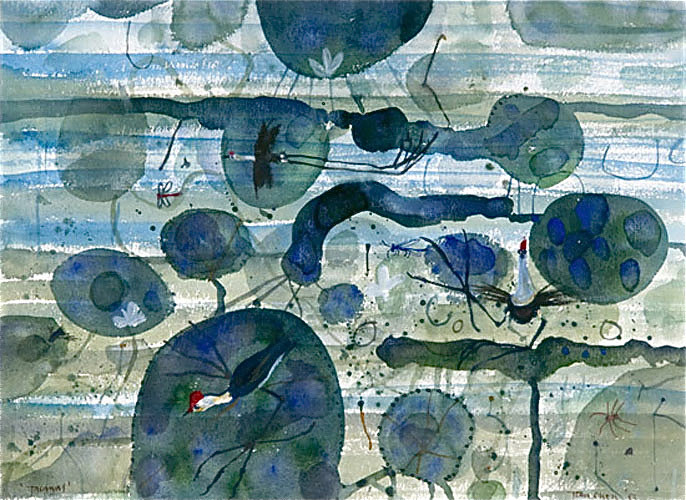 Also the Olsen Frog series is a signature image for John Olsen and has always been very popular. John Olsen as have other artist has felt these mostly Australian fine art edition prints are a way for art lovers to be able acquire an affordable piece of his wonderful fine art works as there is only one original painting, works on paper or water colour. John Olsen’s traditional fine art etchings prints silkscreen’s Lithographs have so far made it possible to let the public enjoy his work, how ever now with the Australian fine art edition quality prints they can enjoy his fine paintings and works on paper even more so. Etching House has in stock 1 only John Olsen limited edition fine art print titled “Jacanas, the Christ Bird 1983″ The John Olsen book titled “Complete Graphics 1957-2005 Teeming with Life” contains reference to this work titled Christ Bird, the book contains an original signature along with a sketch on the contents page, the edition has since sold out and it is a very good reference book for Johns works. John Olsen has since the 1970s sold almost 2300 works of art in the Australian auction market alone, in 2009 to date there has been nearly 140 sales. In 2006 Hobart, John Olsen’s “Love in the Kitchen” sold for a record $1,075,500 at Auction.